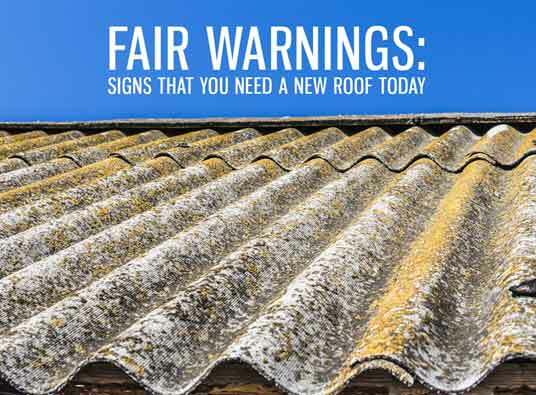 Fair Warnings: Signs That You Need a New Roof Today. Your roof isn’t just a structure over your head. It’s your home’s backbone, protecting your household and possessions from the ravages of time and the elements. Do I have water stains on the ceiling? Water stains are a sure indicator of a leaking roof. Start your inspection with the attic and work your way down. The more stains you find, the sooner you should have your roof replaced. You can make ceiling inspection a fun activity by getting the kids to check the ceilings in their own rooms. Are the shingles curling? You have two kinds of curling to look out for: cupping, meaning the shingle is curling in the middle, forming a tent; and clawing, where the shingle curls at the edges. One or two shingles could be repaired, but several curling shingles mean it’s time to make calls to roofing companies in Michigan for a new roof. Are all the shingles still there? A few missing or cracked shingles aren’t causes for concern, but several loose, missing or damaged shingles are not good signs. Are there granules in the gutters/water runoff? It’s best to check this on a rainy day. Like shingles, a few granules won’t hurt, but a lot is a different story. Granules in the gutter mean the asphalt in your shingles is starting to slough off and should be replaced. How old is my house? Or more specifically, how old is your roof? If your answer is “over 20 years” a new roof should be a priority. Roofs are expected to last about 20-30 years depending on the type and material use; 20 years would be cutting it close to your roof’s lifespan. We strongly recommend against climbing up onto your roof at the risk of it collapsing (and taking you along with it). If you need a quick visual inspection, use a pair of binoculars. For a more thorough inspection, there are Michigan roofing companies that you can get in touch with, like Kroll Construction. Better yet, schedule a regular inspection every three to five years. Kroll Construction can perform a thorough inspection and give you advice if anything needs to be repaired or replaced. Simply give us a call at (888) 338-6340 or fill out our contact form to get started.